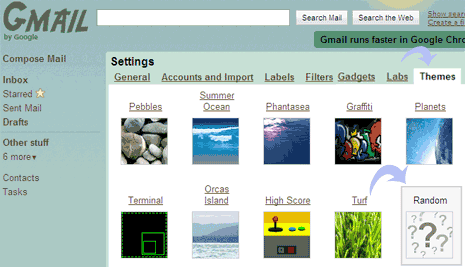 Gmail has added new themes along with new “random theme” feature. It allows you to see Gmail inbox with new look theme everyday you login into it. With lot of Gmail themes, this feature will randomly set different theme for a new looking Gmail inbox daily! How to set Random Gmail theme? 1. Goto Gmail.com & login into your account. 2. Click “Settings”at top right part of webpage. 3. Then click “Themes” tab on settings page. 4. Then click “Random” theme option (last one). Now you are all set to see fresh Gmail theme everyday when you login into your Gmail inbox. Keep it fresh!.